I’m sure most of you have at one time or another typed “pinewood derby” into the Google search engine. At the date of this writing, Google reports about 540,000 matches for this search term. Of course, many of these hits reference to pages within a given site, so the actual number of web sites is considerably smaller. For example, typing, “site:maximum-velocity.com” into Google shows 345 of the 540,000 listings are from maximum-velocity.com. So, how many different pinewood derby sites are in the Google directory? I don’t know, but I decided to go though the numerous search results pages to see how many sites would be displayed and to find some interesting sites to share with you. So after much eye strain, here is what I found. I hope you enjoy them. In general, the search results can be organized as businesses, tip sites, pack/organization sites, Blogs, and news articles (and one band). I have picked out a few sites and organized them in a way that I hope is more helpful. StoriesPinewood derby memories abound on the web. The most popular is the “Gilbert” story, which is contained on literally hundreds of web sites. I don’t know if the Gilbert story actually happened, but it is a heartwarming story. White glue, yellow glue, tacky glue, hot glue, Super Glue, epoxy, Gorilla Glue; the list goes on and on. With the wide variety of adhesives available today, it’s no wonder there is confusion as to what is the best adhesive for pinewood derby cars. So today we will take a look at the most common glue types on the market and indicate how they work with pinewood derby cars. White glue – This is a generic term for glues such as Elmer’s Glue- All, School Glue, etc. This type of glue can be used on wood, paper, cloth, etc. White glue is water soluble, so it isn’t intended for use when the end product will be exposed to water. For pinewood derby cars, white glue works fine for gluing wood to wood (such as adding wood accessories) and for repairing chips or cracks in the wood. It can also be used for holding the axles in place. White glue doesn’t work well on metal, so don’t use it to glue metal accessories or weight to the car. Yellow glue (Carpenter’s Glue) – Yellow glue is essentially a formulation of white glue that has a higher tack (dries quicker, less clamping time), and is more durable in wet conditions. For pinewood derby cars, it has the same uses as white glue, except that it does hold metal to wood better than white glue. Tacky Glue – This is a variety of yellow or white glue with a high tack, sold for use with crafts. It has the same uses as white or yellow glue. PineCar offers a version of tacky glue named “Formula Glue”. Hot Glue – Hot glue comes in sticks which feed into a glue gun. The melted glue can then be used to attach a variety of items. One benefit of hot glue is the very fast dry time (but you have to work fast). A downside is the filaments of glue that are left behind – they can be easily removed, but are an annoyance. Also, a hot glue gun and children don’t readily mix, as you can get a nasty burn from the glue or the tip of the gun. I don’t recommend hot glue for attaching wood to wood, but it does work well for gluing weight into pockets or holes. Epoxy – My favorite glue, epoxy, is a two-part glue that will glue most anything. There are a wide variety of epoxy adhesives available, some intended for metal, some for glass/plastic, and others for general use. I like a general use epoxy with a five minute set time. You can find it Here. Epoxy can be used for attaching metal accessories to the car and, since it does not shrink when dry, it works well for gluing weight into holes or pockets. It can also be used for gluing wood to wood, but I recommend yellow, white, or tacky glue for that use. Super Glue – Super Glue is a brand name for cyanoacrylate (CA) adhesive. This glue is very strong, especially when gluing non-porous materials that contain traces of water. It also works well on human skin. Unfortunately, super glue has a low shearing strength and does not work particularly well on wood. So I don’t recommend it for pinewood derby use, except when a quick repair is needed at a race. Gorilla Glue – Gorilla Glue is a brand name for a polyurethane adhesive. While setting, it expands to fill gaps, and tends to work well when attaching wood to wood. However, for fine hobby work the expansion during setting can cause significant issues, so I don’t recommend this glue for pinewood derby use. The Cubs in my Pack always like to give me ideas for the next year’s “Pace Car” and this was one they gave. It was made after an actual dune buggy that a Cub’s father had in his garage. 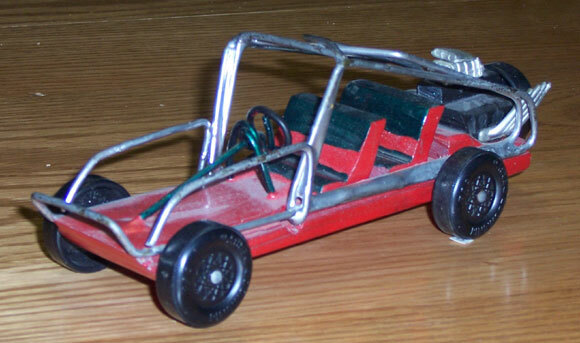 I used a wire clothes hanger and a derby kit to create the car. It ran very fast but was a little tail heavy. 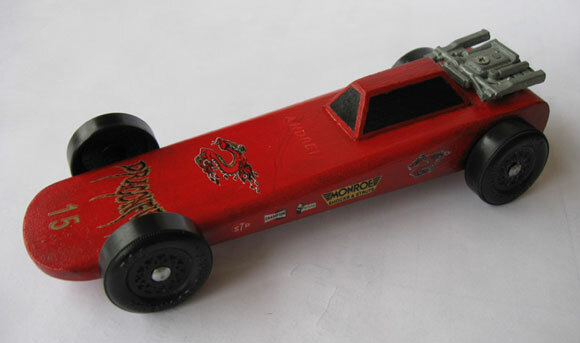 This was our first Pinewood Derby car ever. The car body, accessories, and press-on decals were easy, but the car was pretty fast too, having the 5th fastest combined times in our competitive Pack and won 1st in the Tigers race. The engine/muffler on the back was originally designed as underside weights, but worked nicely to place COG toward the back at 1 1/2 inches from the rear axle. We learned a lot of things to make our next car even better and faster. This year my grandson Dylan and I decided to sacrifice a little speed for creativity. 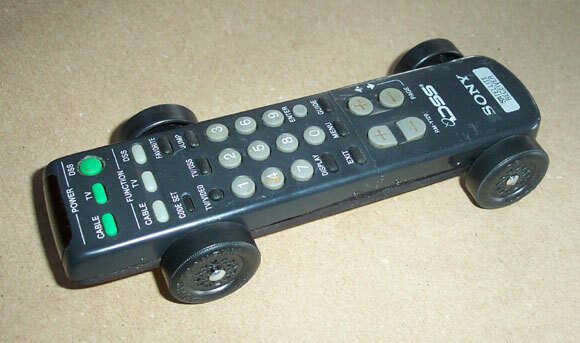 We found an old DirecTV remote control which was exactly the right width and attached it to the official BSA block. Aerodynamics and center of gravity weren’t ideal, but the car placed first in Den and first overall (~50 cars). This was our fourth consecutive year winning the overall title. As in all of the past years, we used Maximum Velocity Max-V-Lube and tungsten cylinders to good advantage. We have to build Cub Scout and Awana cars. Since the Awana wheelbase is centered, would it be ok to use the same weight position as on the Cub Scout car? With any wheelbase, you would like for the car’s balance point to be about 1 inch in front of the rear axle. If you set this balance point on the BSA kit (which has the rear axle about one-half inch closer to the end of the block than on the Awana kit), then on the Awana kit the balance point will be less than one inch in front of the rear axle, which could lead to instability. What is the preferred method for gluing in axles? I previously used hot glue, except last year we went with Elmer’s white glue. I was told that if you wet down the wood and use gorilla glue it will not foam and works best, but my past experience is that gorilla glue is messy. I don’t like gorilla glue for the reason you point out. The strongest glue is epoxy. The only drawback is that it is virtually impossible to remove the axles once they are glued in. If you don’t intend to remove them later, then use epoxy. Otherwise, use a yellow glue like “Tacky Glue” or carpenter’s glue. As it dries, it does shrink, so you have to add more. It holds well, but does allow axle removal (grasp the axle head and rotate to break the glue bond). Have you ever heard of “set back axles” – cutting off some wood behind the rear axle and gluing it to the front of the car to get the weight higher up on the track? Yes, this is a common technique to get the rear axle further back so that the balance point can be set further back on the car. If allowed in your race, you can generally get some added performance by shifting the wheelbase back. By the way, instead of cutting and gluing the block, you can turn the block over and cut new offset slots, or drill offset holes (if allowed by the rules).